I’ve been feeling guilty about using red dye in our peppermint swirl marshmallows ever since I did it, and I knew I needed a new plan before I made our annual batch of candy cane cookies (watch for an update with tips and tricks for these favorite cookies tomorrow!). 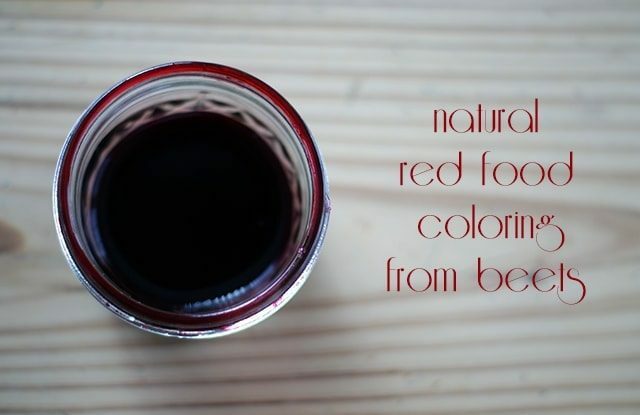 I’ve purchased natural food dye before, but I really wanted to try making it instead this time. Turns out, like many pantry staples, it’s a cinch to make. Natural food coloring will never reach the same vibrancy of artificial food dyes, but they’re really very pretty if you set your expectations right from the start! Note: I tried making powdered food coloring as well, which didn’t work at all for me, so I may need to experiment a bit more with that! Scrub the beetroot like you would a potato or carrot. Remove and discard both ends. Chop into 1″ pieces (no need to peel). Place in a single layer in a saucepan and cover with water. Bring to a boil and then reduce heat and continue to simmer for 1-2 hours until just 1-2 tablespoons of liquid remain. The more you simmer, the more concentrated the dye will get. Transfer liquid to a jar with a tight lid. Add several drops at a time until you achieve the color you want. P.S. Come back tomorrow and I’ll show you what this dye looks like in my candy cane cookies! I wonder if you would achieve powdered food coloring if you dehydrated the beets first, then mixed them into a powder in the food processor . I know some natural, (crunchy), bloggers have done this in order to get coloring for homemade lip balm, blush etc. Also, you can buy beet powder and other veggie powders from Amazon. Hope that helps. Still enjoying this 101 days of Christmas series, makes me long for the days when I worked as a nanny. That’s actually how I did the powder, but unfortunately it did nothing when I added it to the cookie dough!